Latvia has landed another high-profile coach.Former Stanley Cup champion and Jack Adams Award winner Bob Hartley has been hired to lead the Latvian national team.“I’m excited for the newest challenge in my career as a coach. It will be my first experience working with a national team and I’m grateful to the Latvian Hockey Federation for giving me the opportunity and confidence,” Hartley told IIHF.com’s Martin Merk. Latvia’s former coach resigned this summer just before the program failed to qualify for the 2018 Olympics in Pyeongchang. The country’s best finish at an Olympic competition came three years prior in Sochi under the direction of longtime NHL coach Ted Nolan. That team played Canada to a 2-1 final, and eventually finished eighth. Hartley was fired by the Calgary Flames at the end of last year after failing to return to the playoffs in his fourth season. Captain Marie-Philip Poulin and the rest of Canada’s women’s national hockey team sent a message to the United States. 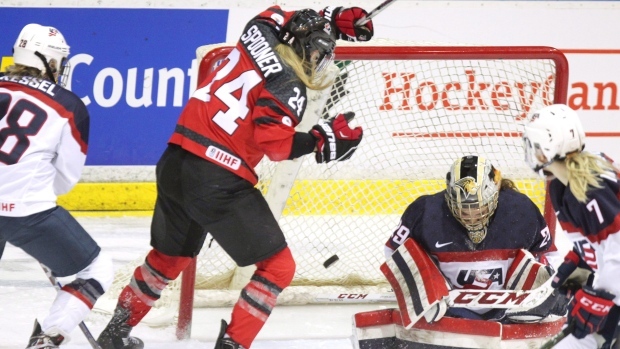 Poulin scored just 42 seconds into overtime as Canada rallied to a 3-2 win over the United States on Monday in the second half of a two-game exhibition series between the women’s hockey powers. The Canadians won both games, important victories over their arch-rivals ahead of the world championships in Plymouth, Mich., from March 31 to April 7. Poulin scored the winner on a partial breakaway, carrying the puck up the right side of the ice before cutting to the slot and firing the puck on the net. Head coach Laura Schuler was pleased with the win and what she saw from her team, but thinks they can be even better. In particular, Schuler wants to see her players be more disciplined. Jennifer Wakefield blasted a one-timer from the hashmarks in to tie the game with 24 seconds left in the third, forcing the extra period for Canada. Rebecca Johnston had scored early in the first. “It was a drawn-up play and they executed what we had drawn up perfectly,” said Schuler. “Jenny has one of the hardest shots on our team. She just put everything she had into it and fired it past the goalie. Shannon Szabados made 23 saves for the win. Jocelyne Lamoureux-Davidson and Hilary Knight gave the United States a 2-1 lead by the second intermission. Nicole Hensley stopped 17 shots.